Before teaching a graduate school class at UW, or mentoring an entrepreneur, or giving a workshop, I take a few minutes to repeat the above advice as a simple mantra. It is a reminder to focus on those I am interacting with and not on what I want to say. How will you know that you created it? What resources do you have to get started now? What other opportunities will this lead to? 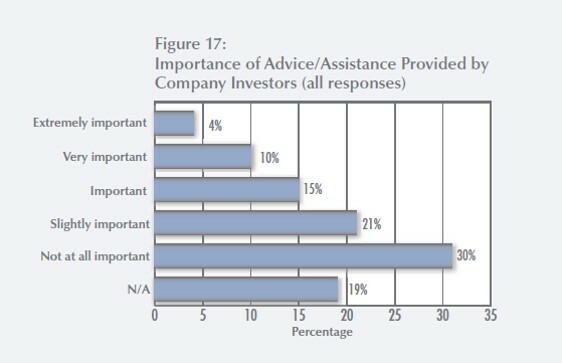 Over half of the successful entrepreneurs didn’t think that investor advice was important or applicable. I was stunned at these numbers. Then I remembered my own experiences with investors and consultants that were forced upon us by our investors. I wanted their money, not their advice. I listened to their advice and then dismissed it. They didn’t understand my business and my unique circumstances. Much of what they had to say was platitudes. Worse, for every five people giving advice there were ten different conflicting opinions. I would nod and appear interested until the money was deposited and then go about doing what our business really needed. Yet, it is not just one directional. Entrepreneurs think that investors and mentors really want to hear their “pitch” rather than have a conversation and an opportunity for mutual learning. As we started our video ethnography study with the nine companies in the 9Mile Labs accelerator, this key issue of mentor/entrepreneur communication (or lack thereof) emerged as a research focus. Yet there was something about this theme that was important and elusive. “Towards the end of grad school, I learned a key lesson about academia. I was discussing a draft of a dissertation chapter with my second reader. Although not my adviser, her work was critical for the arguments that I was building about psychological trauma and technology. Toward the end of the conversation, she said something to the effect of, “You know, this chapter could really use more Heidegger.” Inside, my heart sunk a bit. “Great,” I thought, “more to read. And from an author whose work I don’t really know.” But I dutifully wrote, “More Heidegger,” in the margin of a page, and after the meeting, I checked out a copy of The Question Concerning Technology. “I read Heidegger and tried to understand how his views on technology fit into his and my larger projects. It wasn’t especially easy going. And perhaps in the third day of thinking about Heidegger, I had an epiphany that was perhaps closer to dasein than technology. As I came to see it, her comments were not so much about the dissertation that I was writing so much as they were about what the dissertation would be if she were writing it. Her comments were built on her wide knowledge of continental philosophy and the fact that she really could have deployed Heidegger effectively in the argument. But it wasn’t reflective of the reality of what I was going to be able to produce at this point in my career. I dropped Heidegger from all but a half sentence in my introduction, and my reader never brought it up again. The 9Mile Labs partners went further by having several matching processes to link the right mentors with the appropriate start-ups. They even provided financial compensation for the matched mentors. However, the hidden assumption was that the mentors knew how to work with the entrepreneurs and vice versa. The mentors made recommendations based on how they would do the work, but the entrepreneurs neither knew how to receive the information or what help to ask for in a timely fashion. The entrepreneurs were doing the same thing that I did in my serial entrepreneurial past – do you have some money to invest in my company then I will appear to pay attention to you? If you don’t have money to invest in my company, I will mostly be polite and then completely ignore your advice. Experience first; make meaning second. Yet, there is a foundational issue with mentoring – what is the evidence of credibility of the mentor such that the entrepreneur is interested in listening in the first place. Further, the evidence must be very directly and immediately relevant to the entrepreneur. I didn’t understand this until spending time with Paul D’Antilio (currently COO of GroupTie) when he became CEO of Future Point Systems. He invited me in to share my thoughts on the visual analytics marketplace and what he should do as a CEO. After fidgeting for an hour while I pontificated on the market and what he should do (violating my mantras above), Paul blurted out “Why should I listen to you? What have you done? How do I know that Attenex was really successful?” I was stunned. I thought I’d just been brilliant and enormously helpful and came face to face with Paul “hearing” nothing because of my lack of credibility. I was stuck because I knew that I couldn’t share that the announcement of Attenex being sold to FTI Consulting for $91M was still a month away. Mentoring and being a mentee is indeed hard work. Yet, when the magic happens, there is nothing more rewarding for a mentor than seeing a mentee push forward. For a mentee, there is the gift of knowing that they have a trusted colleague they can turn to whenever needed. This entry was posted in Content with Context, Entrepreneuring, Flipped Perspective, User Experience. Bookmark the permalink. Pingback: SKMurphy, Inc. Quotes For Entrepreneurs-October 2016 - SKMurphy, Inc.